Alaskan Playground: "Some people build swimming pools in their back yards. But outdoor pools in Alaska just won't work. 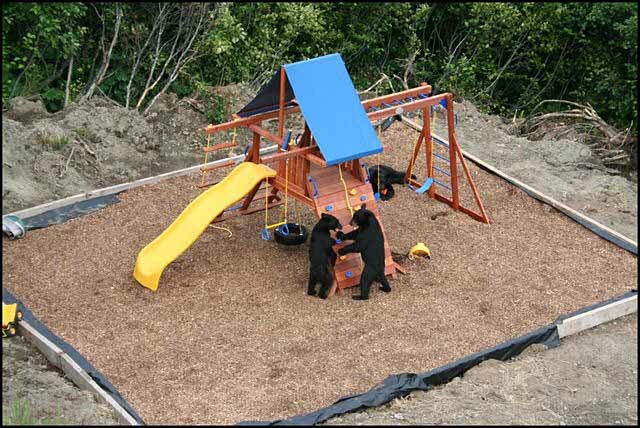 Since this particular family lives on the outskirts of Anchorage, they decided to build a sturdy, colorful playground for their 3 and 4 year old sons, with smooth-stone gravel all around it to avoid knee scrapes and other injuries. They finished building it on Saturday evening, and the following morning, as mom was about to wake up the boys and have them go out to play in their new play center, this is what she saw from the upstairs window:"